Scottish fishing chiefs insisted last night that the industry had “embraced the principle” of ending discards at sea. One of them said fishers were “on the path of smooth transition” to fully complying with the discard ban, or landing obligation as it is known, which now covers nearly all fish caught commercially in EU waters. It comes after a House of Lords commiteee “found little evidence of the landing obligation being followed to date”. In its report on the implementation and enforcement of the ban, which was phased in and has been fully in force from the start of this year, the Lords’ EU Eenergy and environment sub-committee also said peers encounteered an “almost unanimous view” that the UK was not ready for full implementation. It added: “Ensuring compliance with the new rules requires the ability to monitor fishers at sea, to observe if any discarding occurs. “The only effective way to do this is by installing cameras and other monitoring devices on vessels. “But few boats in the UK currently have this installed and the UK Government will not mandate it unless other EU countries do the same, for fear of putting UK fishers at a disadvantage. Following a probe into the impact of the discard ban to date, the report said: “Most witnesses reported that the landing obligation had little effect during the phasing-in stage. “Many witnesses also told us … this limited impact was because the requirements of the landing obligation were not being complied with. Scottish White Fish Producers’ Association chief executive Mike Park said: “The failings identified in the report, which are not the fault of industry, should come as no surprise to our European legislators. “The industry is making serious gains with regard to improved selectivity and the avoidance of unwanted catch. “The fishermen themselves are the people that will make the new system work and i am happy to report that we are on the path of smooth transition to full compliance of the regulation”. 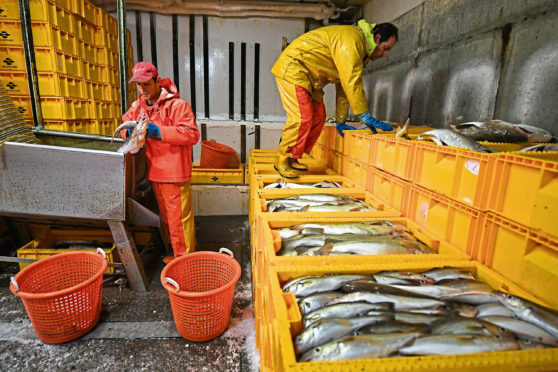 Scottish Fishermen’s Federation chief executive Bertie Armstrong added: “The Scottish industry has absolutely embraced the principle of ending discards.